This is a light-hearted and fun look at quite a serious issue.. Enjoy.. Anyone notice a similarity between these 2 words: Santa and Satan. Yep, they're pretty similar. In fact they have the same letters, just in a slightly different order. Spooky or what..
Just take a look at these 2 images. It's a conspiracy..! Or click here for a larger Santa image.. And click here for a larger satan image in a new window. Funny & Quality Youtube Videos! How many people can see that both Santa and Satan are often pictured as wearing a red outfit. There's even a pointy red hat on both of our two characters..! Yet, while they both are often pictured as wearing red, they are very different. One has a cartoonish appearance, the other looks pretty menacing. Take a look at what you are wearing today. What does it say about you? When you look at pictures of Santa or satan, what images does it bring into your mind? 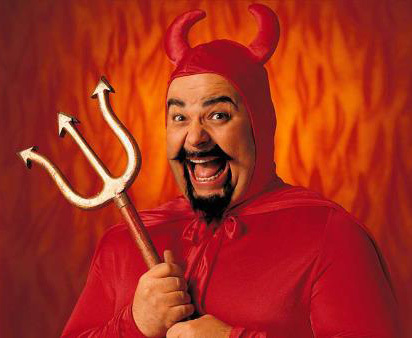 The funny thing is that the Bible doesn't describe satan as wearing a red outfit anywhere - in fact he is described as masquerading as an angel of light (2 Corinthians 11.14) and deceiving people, including the church. We know that hell is very real, with a fiery lake of burning sulphur as described in Revelation 19.20. We also know that this will be a place where things will be taken away, where people are cut off from God, where they go into an outer darkness, and where there will be weeping and gnashing of teeth (see Matthew 8.11-13 among other Bible passages). Doesn't sound much like a great Christmas..
Satan is a deceiver. He is not original in thought or ideas. Instead, he copies God the creator but upside down, and never as well. (God has the church. The evil one has similar kinds of things in place. God has angels. The evil one has demons etc). But God is so much more powerful. The true meaning of Christmas should be about Jesus becoming a baby, coming to earth and starting to work out God's plan to help people get right with him. The attempt of satan has been to distract from this message by doing everything he can to turn people away from Jesus and this true meaning. 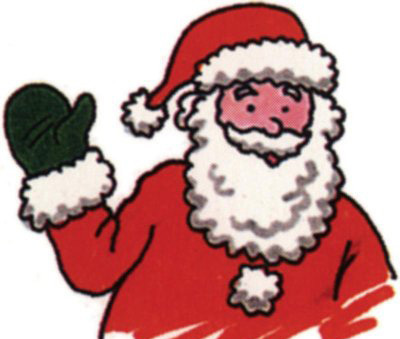 In a strange way, Santa does something similar - as this mythical figure promotes giving and receiving presents - as if this is the way to true happiness. We know that the day after Christmas, often an empty feeling is left, along with the empty boxes and wrapping paper. Please watch this clip first (checked December 2017) and just check that you are OK with using it. The clip is from Talladega Nights and joins a family sat around the table, praying to 'baby Jesus' - with the different (not Biblical!) ideas it throws up. Use as a discussion starter. Do we worship the baby Jesus still? How is the risen Jesus different to the Christmas picture of Jesus? How is Jesus made relevant through your life? "He's making a list, he's making it twice. He's gonna find out who's naughty and nice.. Santa Claus is coming to town... He sees you when you're sleeping. He knows when you're awake. He knows when you've been bad or good, so be good for goodness sake." (Song - 'Santa Claus is coming to town'). There is a popular myth around that you have to be good in order to 'get your present'. But the Bible is clear that what Jesus does is completely the opposite. It says in Romans 6:23, "For the wages of sin is death, but the gift of God is eternal life in Christ Jesus our Lord." Then in Ephesians 2.8-9 we read, "For it is by grace you have been saved, through faith—and this not from yourselves, it is the gift of God - not by works, so that no one can boast." So Jesus gives us the free gift of an abundant life in him, and an eternal life with him in heaven. Nothing we can do can earn this. We don't deserve this, but he makes this available to us. All we have to do is accept! In the Old Testament, we find a similar thing. The law was all about 'works' - doing things in order to please God. The religions of the world all follow a similar pattern. In Islam, Judaism and Hinduism, the only way to please God and get right with him is by doing things. For example, by praying 5 times a day (Islam), offering sacrifices and strictly following the law (Judaism) and offering foods to gods (Hinduism). Christianity is often taught as being about 'obeying the 10 commandments' and obeying Jesus. But actually it's nothing like that. Christianity should be the only religion in the world that isn't religious!! Why? Because it's about the fact that when people say yes to Jesus being in charge of their life, he gives us his Holy Spirit and so totally changes us inside that we want to obey him and be like him. It's not the rule that makes Christians do what they do, it's the change of their heart that Jesus makes happen. Again, these are from Youtube. Please watch before using, or find your own clips. We teach our children to be wary of strangers and not to accept sweets from strangers. We lock our houses and have all kinds of security devices. Yet once a year, we open up our house to someone who comes down the chimney and brings sweets and gifts to children!! Have you ever thought how funny that is?! Jesus says something interesting in John 10.10 in The Bible: "The thief comes only to steal and kill and destroy; I have come that they may have life, and have it to the full." Jesus is talking about satan, who he calls 'a thief' and who only wants to 'steal, kill and destroy.' What he does is 'enter the house' of people in the world and turn them against the one true God in heaven. He infiltrates their hearts and minds and blinds people to the love God, turning people against God and even twisting God to be evil. How messed up is that?!! God is love and in him there is no darkness. The only darkness and evil comes from the human heart and satan. If you are Christian, you have God in your life and have the power to resist satan. If you do, the Bible promises that he will run away from us (legging it!) - James 4.7. We must stay full-on for God, reading the Bible, thinking as God thinks, praying and allowing God to change us. We need to stay strong, take a stand and live only for God. It's the only way to live life abundantly, til it overflows with amazing God-things and deeds!! At least the 2 characters come from very different places.. One is icy cold, the other is red hot. Oh, and just remember that one is very real, and one is very fake. But Jesus is Lord and as 1 John 4.4 says, "the one who is in you (God's Holy Spirit) is greater than the one who is in the world (satan)."